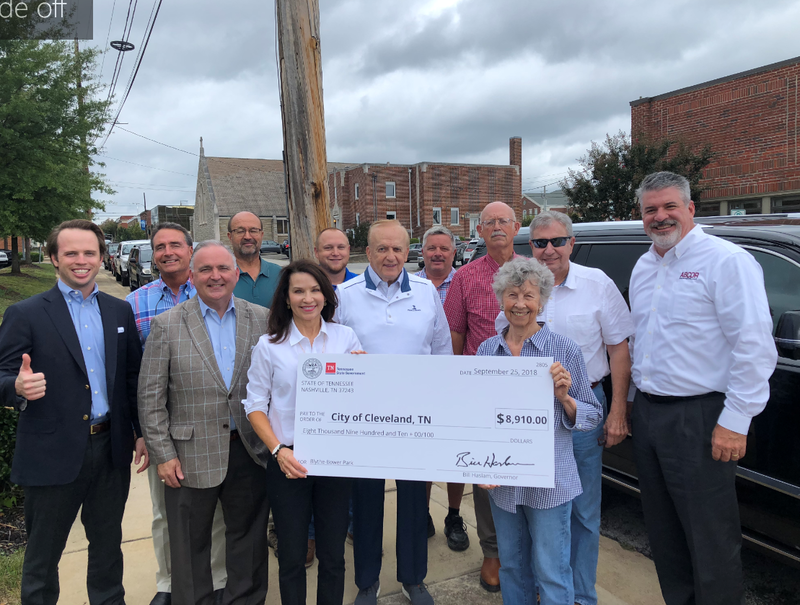 CLEVELAND, TN – Members of the Cleveland City Council and Shade Tree Board celebrated the city of Cleveland being selected as a grant recipient under the Tennessee Agricultural Enhancement Program from the Tennessee Department of Agriculture’s Division of Forestry. The city applied for this competitive grant earlier this year and will receive $8,910 from the state of Tennessee. The city will match an additional $8,910 as required in the grant contract with a total of $17,820 for the project. Grant funds will be used to enhance tree canopies for shade coverage and landscaping at a new park behind Blythe-Bower Elementary School. Tree planting will begin after November 1, 2018. Pictured left to right back row: Will Jones, Tim Henderson, Dan Hartman, Nick Romito, Dennis Epperson, and John Thomason. Pictured left to right front row: Mayor Kevin Brooks, Amy Banks, Councilman Dale Hughes, Jo Benjamin, Councilman David May and Councilman Tom Cassada.